Ukraine (Ukrainian: Україна, Ukrayina) is a country in eastern Europe which borders the Black Sea and the Sea of Azov to the south, the Russian Federation to the east, Belarus to the north and Poland, Slovakia, Hungary, Romania, and Moldova to the west. Once a constituent republic within the Union of Soviet Socialist Republics (USSR), Ukraine has been an independent country since the dissolution of the union in December 1991. Under the Soviet system it was called the Ukrainian Soviet Socialist Republic. The city of Kiev (Київ, Kyiv) is both the capital and the largest city of Ukraine. During the 10th and 11th centuries AD, Ukraine was the center of the first Slavic state, the Kievan Rus'. The region adopted Christianity in 988 AD by the official act of public baptism of Kiev inhabitants by Prince Vladimir I. Compared with the languages of European Christendom, the Ukrainian language was little influenced by the Greek and Latin of early Christian writings. This was due to the fact the Slavic was used directly in liturgy instead. Old Church Slavonic was the first literary and liturgical Slavic language employed by the 9th century missionaries, Saints Cyril and Methodius. The Kievan Rus' ultimately disintegrated as a state because of the armed struggles among members of the princely family that collectively possessed it. Conquest by the Mongols in the 13th century was the final blow. The Kievan Rus' was succeeded by the principalities of Galich (Halych) and Volodymyr-Volynskyi, which were merged into the Kingdom of Galicia–Volhynia. In the 14th century, most of the territory was annexed by Poland and Lithuania (both of whom later merged to form the Polish-Lithuanian Commonwealth in 1569), but during that time, the Ukrainian people began to regard themselves as a distinct people, a feeling which survived subsequent partitioning by greater powers over the next centuries. In addition, Ukrainian peasants who fled the Polish effort to force them into servitude came to be known as Cossacks and earned a reputation for their fierce martial spirit. 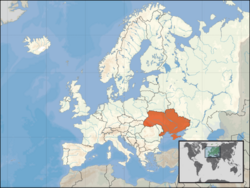 In 1667, Ukraine was partitioned between Poland and Russia and it was reunited as part of the Russian Empire in 1793 with the west becoming part of Austria-Hungary. The 19th century found the region largely agricultural, with a few cities and centers of trade and learning. When World War I and the Bolshevik Revolution in Russia shattered the Hapsburg and Russian empires, Ukrainians declared independent statehood. In 1917 and 1918, three separate Ukrainian republics declared independence. The country was reconquered and experienced a Soviet rule that engineered two artificial famines (1921-1922 and 1932-1933) in which over 8 million people died. In World War II, German and Soviet armies were responsible for some 7 million more deaths. Renewed independence was achieved in 1991 with the collapse of the Soviet Union and, subsequently, Ukraine became a founding member of the Commonwealth of Independent States. The majority of the population of Ukraine (72%) practices Orthodox Christianity, split between three Church bodies: the Ukrainian Orthodox Church - Kiev Patriarchate (39.8%), the Ukrainian Orthodox Church - Moscow Patriarchate (29.4%), and the Ukrainian Autocephalous Orthodox Church (2.8%). Followers of the Eastern Rite Ukrainian Greek Catholic Church, which practices a similar liturgical and spiritual tradition as Eastern Orthodoxy, but is in communion with the Holy See of the Roman Catholic Church and recognizes the primacy of the Pope as head of the Church, make up 14.1% of the Ukrainian population. Additionally, other religious minorities include Latin Rite Catholics (1.7%), Protestants (2.4%), Muslims (0.6%), and Jews (0.2%). 2% described themselves to be adherents of other religions or non-religious, agnostic or atheist. The official language of Ukraine, according to its constitution, is Ukrainian (Українська мова, Ukrayíns’ka móva). Russian, which was the de facto official language of the Soviet Union, is widely spoken, especially in eastern and southern Ukraine. Ukrainian is spoken by 67% of the population, 24% speak Russian, and Crimean Tatar, Bulgarian, Romanian, Polish, Hungarian, Rusyn-speaking minorities make up the remaining 9%. Ukraine's current population is 45,905,341 with ethnic Ukrainians forming a majority of about 77.8% of the population, according to the Ukrainian Census of 2001. Other significant ethnic groups are Russians (17.3%), Belarusians (0.6%), Moldovans (0.5%), Crimean Tatars (0.5%), Bulgarians (0.4%), Hungarians (0.3%), Romanians (0.3%), Poles (0.3%), Jews (0.2%), Armenians (0.2%), Greeks (0.2%) and Tatars (0.2%). ↑ "Ukrainian Greek Catholic Church (UGCC)". Retrieved 2010-08-10. ↑ "Ethnical composition of the population of Ukraine". 2001 Census. Retrieved 2010-08-10.